A delightfully atmospheric tramp through Britain's prehistoric past, from Overton Hill in Wiltshire to Ivinghoe Beacon in Buckinghamshire. 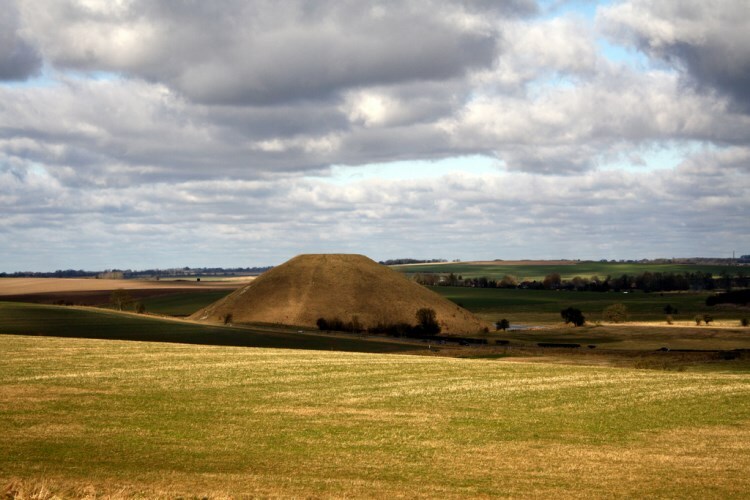 The landscape's rich Neolithic inheritance is reflected in such outstanding monuments as Avebury, Silbury Hill, the West Kennet Long Barrow and the myth-laden burial tomb of Wayland's Smith, whilst a plethora of Iron and Bronze Age forts testify to its later importance. Tackle the full length of the Ridgeway in anything from an ambitious four or five days to a leisurely eight or nine, or explore its best sections one at a time. The Ridgeway is a delightfully atmospheric tramp through Britain's prehistoric past, from Overton Hill in Wiltshire to Ivinghoe Beacon in Buckinghamshire. Passing hill-forts and megalithic monuments, gazing across gloriously unchanged landscapes, and resting in the shade of ancient forests, this is perhaps as close as one can come to walking the land of our ancestors. Walked for millennia - these paths are thought to be at least 5,000 years old - by soldiers, herders and traders, the Ridgeway originally formed part of the longer trade route between the Dorset coast and Norfolk's Wash - its higher ground providing both a dry and a safe course through a Neolithic landscape as yet untamed by its people. 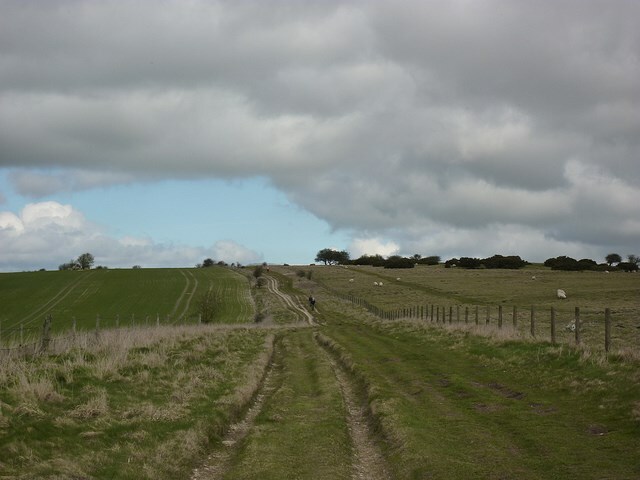 Although, for the ambitious, it is still possible to follow the 'Greater Ridgeway' along the 583km between Lyme Regis and Hunstanton (combining the Ridgeway with the Wessex Ridgeway, the Icknield Way and the Peddars Way), the modern-day Ridgeway runs a more modest 139km from near the World Heritage site of Avebury to more forested Chilterns. It is not known exactly how long these tracks have been in use, and there is speculation that they date back to before the time rising sea levels separated England from mainland Europe in the Mesolithic period. 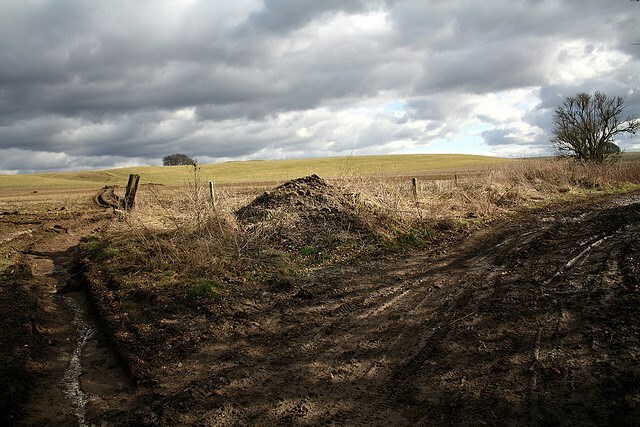 The earliest significant evidence of a human presence on the Ridgeway, however, dates back "only" to after 4000BC, when the development of farming brought a previously unheard-of permanence to the lives of Homo Sapiens, and with it a proliferation of lasting settlements and monuments. Many of the oldest of these are barrows, including the magnificent Wayland's Smithy (a name probably bestowed by the Saxons). Here, according to legend, a traveller whose horse has lost its shoe could leave it here with some money; on their return the next morning, the money would have been taken and their horse re-shod. A corridor of standing stones once linked Overton Hill, the start of the Ridgeway, to the great (now World Heritage) site at Avebury, a vast henge (circular bank and still-deep ditch) girdled by the largest stone circle in Europe and itself enclosing with two more major stone circles. Believed to have been constructed in stages (perhaps reflecting cultural or ritualistic changes) between about 2850BC and 2200BC, this is described by English Heritage as "undoubtedly the most complex" of Britain's Neolithic (or New Stone Age) monuments. 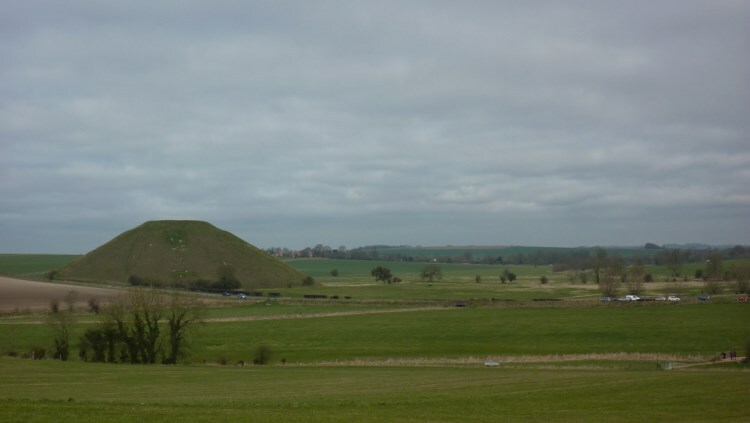 Nearby Silbury Hill, of the same period, is the largest man-made mound in Europe and compares in size to contemporary Egyptian pyramids. As is often the case, the exact origins and purpose of these monuments can only be guessed at. However, it has been generally accepted that their role is likely to have been primarily ritualistic. 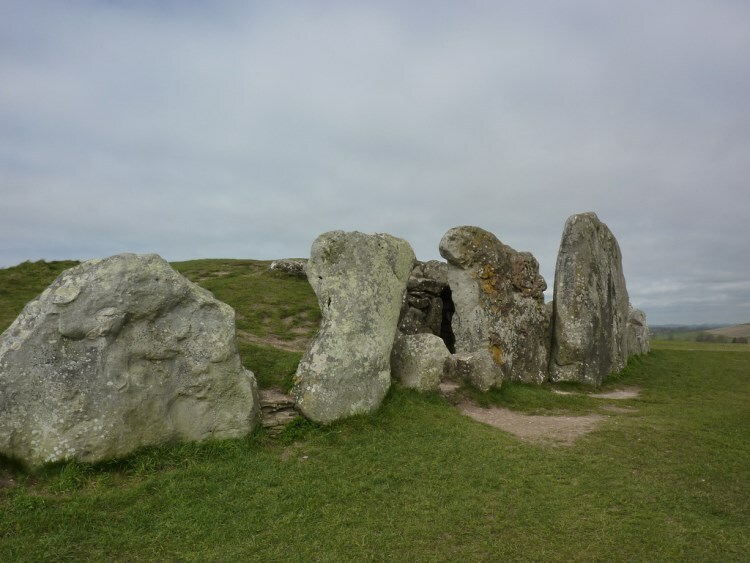 Although the use and expansion of Avebury continued into the Bronze Age, the importance of the site may well have much older roots: nearby West Kennet Long Barrow was built in around 3,650BC and served as a burial chamber for nearly 50 people before it was blocked up. As the Neolithic merged blearily into a new Bronze Age, England saw huge cultural and economic change. Reflecting this is the shift on the Ridgeway from older long barrows, mass burial mounds, to round barrows, housing an individual for eternity. Many of the Bronze Age barrows along the trail are crowned with clumps of beech, an (ill-advised, some would argue) attempt by the Victorians to enhance their landscape. 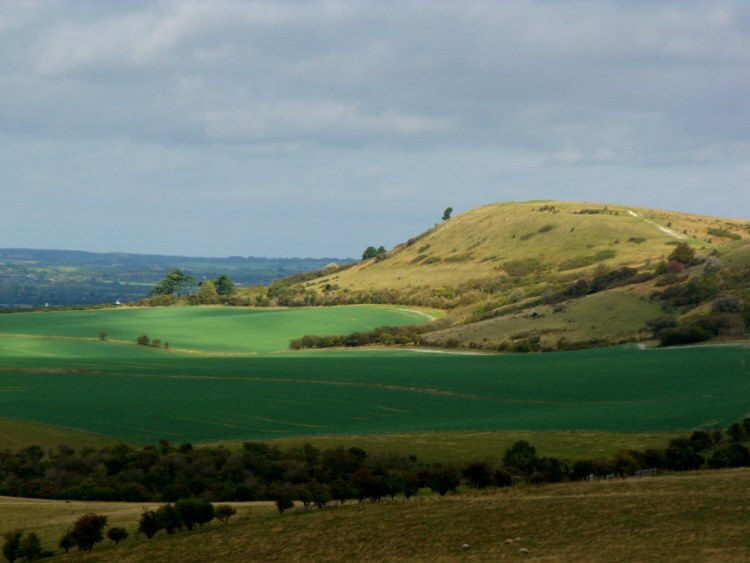 The continuing importance of the great elevated route is reflected in a collection of Iron Age hill forts, from the magnificent earthworks of Barbury and Uffington Castles to the prominent peak of Ivinghoe Beacon, situated at regular intervals along the entirety of the walk. The defensive positioning of the Ridgeway's hill forts is of course their essence, but most are assumed to have also provided a space for some form of social gathering; some (particularly Uffington) suggest a ceremonial focus, whilst others have provided evidence of intensive use as a settlement. Although the idea of a 'Southern Hadrian's Wall' is perhaps too fanciful, the presence of such significant constructions suggests a striking level of social, political and economic organisation very early on in the region's history. Other fascinating remnants of our prehistoric past remain: walkers will follow stretches of those peculiar earthworks known collectively as Grim's Ditch. With an unknown purpose, these small, ancient ditches are found across England and Wales. Perhaps used to demarcate territory, they probably date from the Iron Age. More famously, the trail passes the iconic Uffington White Horse. A distinctive, stylised figure cut into the chalk, this is by far the oldest white horse in England, probably created in the late Bronze or, again, the Iron Age. Other horses and marks are carved through the turf into the predominant white chalk. Romans, Saxons and Vikings adopted and adapted the landscape in their turn, building on pre-existing sites and giving their own interpretations to landmarks already thousands of years old. Relative stability in The Middle Ages altered the patterns of use, with drovers and their herds replacing Saxon and Viking warriors. The next major change wouldn't occur until the dawn of the modern period: In 1750, with England on the verge of profound transformation in both agriculture and industry, the passing of the Enclosure Acts changed the face of rural Britain forever. 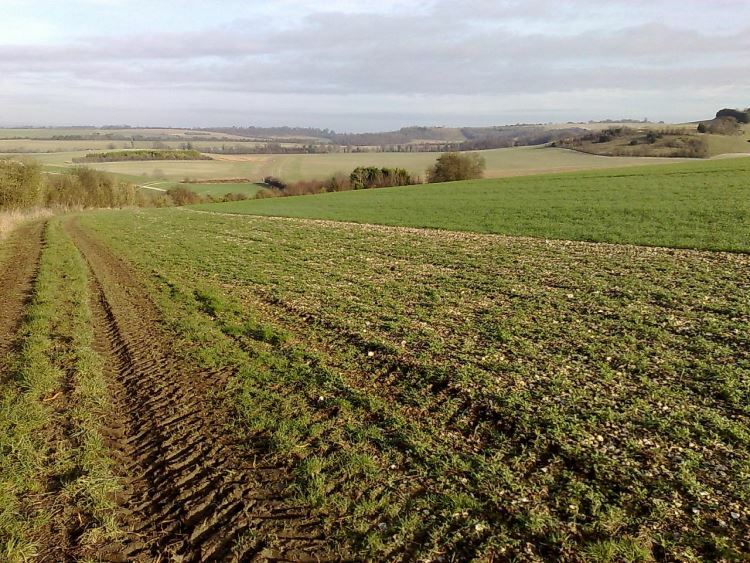 With the loss of common rights and the rapid enclosure of fields in earth banks and hedges, there was also a fundamental change in the way the Ridgeway was used. Where previously travellers would choose the easiest (driest) route among a plethora of trails and tracks, the path now became enclosed within the boundaries that apply today. There are two distinct halves to the Ridgeway, divided by the river Thames at the Goring Gap, and the landscape is surprisingly different. To the west, the (relative, let's not get carried away) isolation of exposed downs, a mixture of relatively grassy downland and large agribusiness fields, dotted with clumps of trees and often commanding scarp-edge views, broken by the brief but shocking interruption of the M4; to the east, the sheltered villages, thickly forested slopes and enclosed fields of the undulating but also more inhabited Chilterns, although they do provide grand panoramas from the escarpment edge. 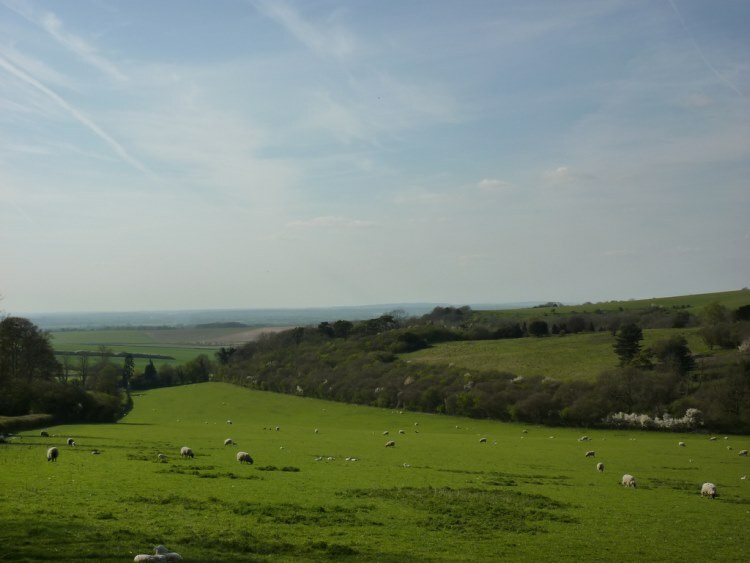 This will be seen by some as sacrilege, but, while the landscape is fine and interesting, and ravishing in places, you don't walk the Ridgeway for its scenery; in world terms, while historically fascinating, it is not that special visually. 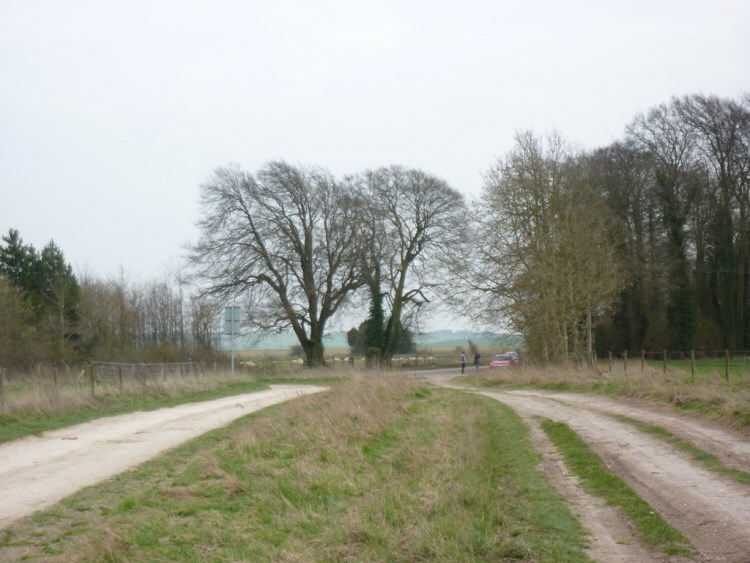 The following six sections are those recommended on the Ridgeway National Trail's website. Those wanting to take in the countryside more gently may want to stretch this out over 8 or more days; experienced and fit long-distance walkers could cover the ground more quickly, although they would miss out on some of the joy of exploring this beautiful landscape. The Cicerone guide helpfully breaks the Way down into 12 sections for those wanting to walk shorter stretches or create return-circuit walks. The official start is a nondescript car park off the A4 at Overton Hill. 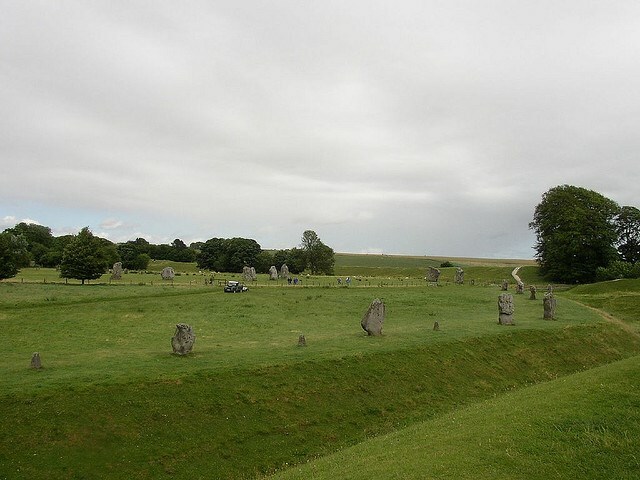 Accessing it without private transport can be difficult, and a good approach is to miss the first couple of miles of the Ridegway, joining it instead on the Wessex Ridgeway from Avebury. 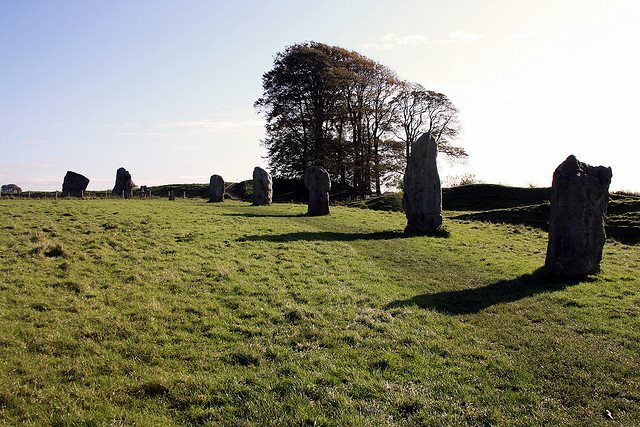 Starting here has the added bonus of giving you plenty of time to explore Avebury's magnificent and (relatively) tourist-free answer to Stonehenge. 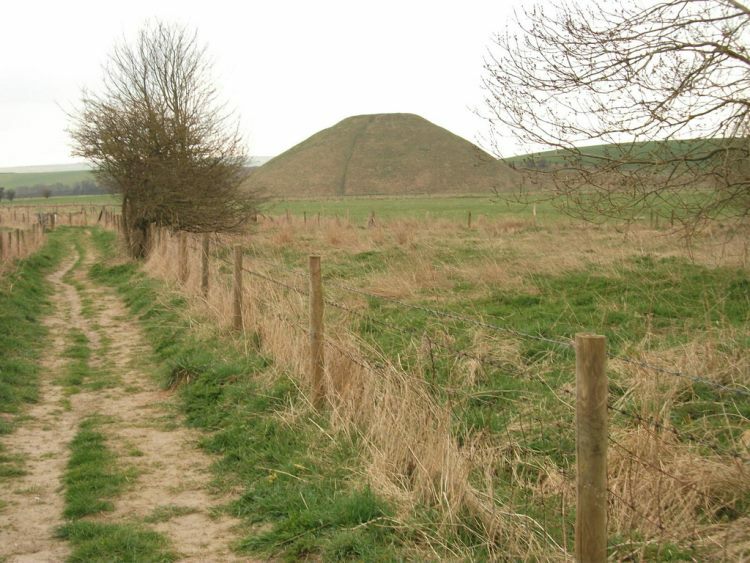 You can add a swing south of Avebury, to view the huge contemporaneous artificial mound of Silbury Hill. Just east of where the track from Avebury joins The Ridgeway properly is an area littered with Sarsen stones, remains of the sandstone layer which once covered the now predominant chalk and which is now memorialized by the great standing stones at nearby Avebury. This is perhaps the most heritage-rich section of all, and ancient monuments abound. Northward, you pass lovely and mysterious beech rings, usually on some old forms in the land, a Victorian white horse and then the huge and magnificent Iron Age hill fort of Barbury Castle on the high edge of the downs (with huge views northward over... Swindon) - as well as some of the area's numerous Bronze Age round barrows. 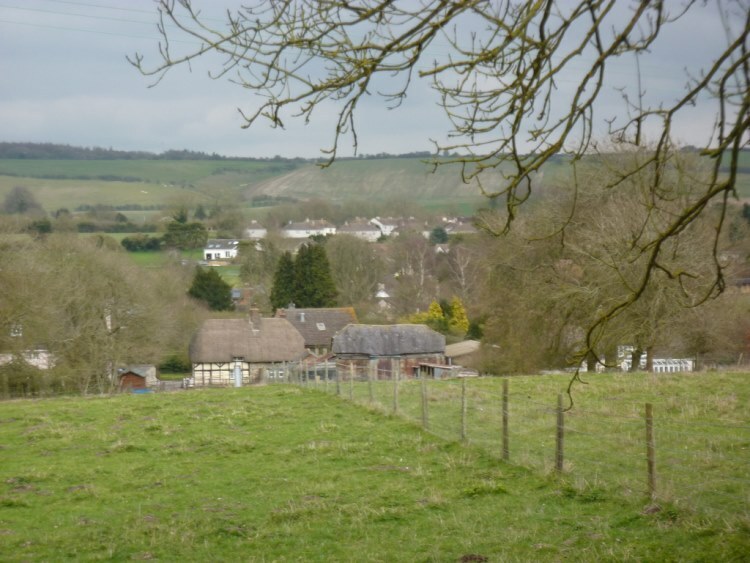 A turn south-east onto Smeathe's Ridge, a diversion from the ancient Ridgeway, gives delightful views over dry, empty valleys before the path descends into the pretty village of Ogbourne St George. Try and fit in time to explore, and check out its Saxon church. This, the most remote section of the Ridgeway, also sees a painful intrusion. After climbing out of the Og Valley, the path levels and leads you to that noisy wound, the M4. Leaving it rapidly behind, you are compensated by a long stretch of gently undulating, often grassy, track which winds along the high ground near the northern escarpment edge, with regular big views up over the Thames Valley and taking in the huge barrow of Wayland's Smithy, the Uffington White Horse and the nearby dramatic hill fort, and a slew of other forts and barrows. Below you, to the north, several small villages are strung out along a line of springs where water trickles out at the base of the chalk scarp. 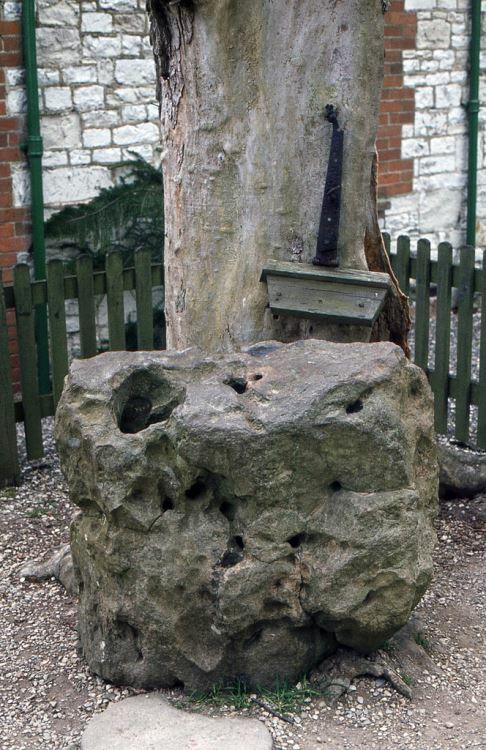 One of the nearby highlights is the Blowing Stone, a holed sarsen stone (the same material used in the construction of Avebury) which, when the right hole is blown into, produces a booming sound. 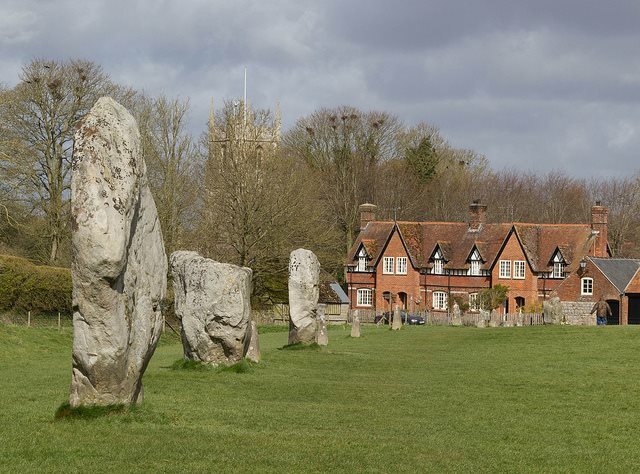 According to local legend it was originally positioned on Blowing Stone Hill, and was used by King Alfred to summon his troops for the Battle of Ashdown. Perched on a high point, near a deep and dramatic cleft known as the Devil's Punchbowl, is the copse of Sparsholt Firs. 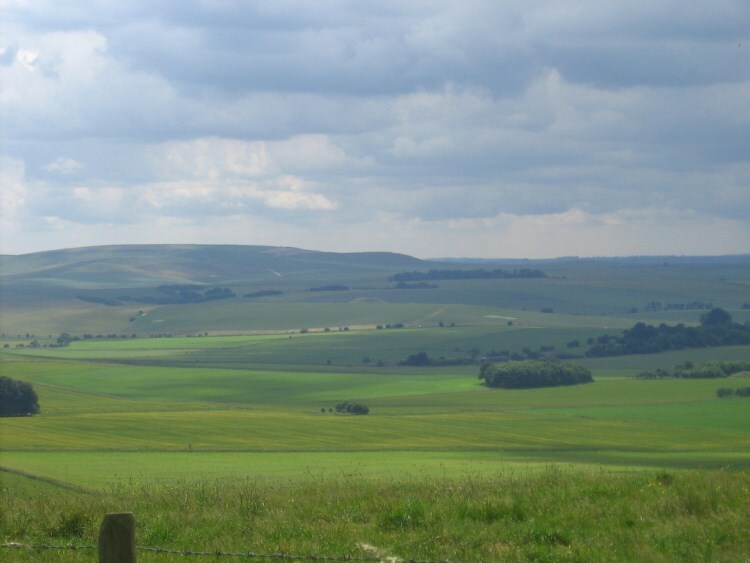 Here, not far from Wantage, the second stage of the Ridgeway comes to an end. Walkers with stamina and a taste for metropolitan sophistication may want to walk on another few kilometres so they can drop down via the Letcombes (which themselves have accommodation) to overnight in Wantage. For much of the path to Streatley, you have huge views northward towards the Thames Valley, albeit over large agribusiness fields and with (until recently) Didcot power station's curiously pleasingly-shaped (well, to some) cooling towers looming in the middle distance. To the south stretch rolling downlands, punctuated by small patches of woodland. If you set off early, you are likely to see racehorses on the area's numerous gallops. While this stage has fewer historic marvels than stage 2, it is fine walking nonetheless, heading pretty straight along the high ridge. You are into proper chalk country by now. 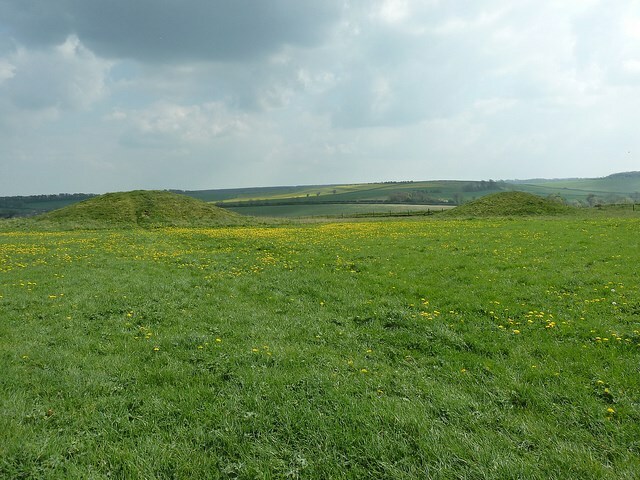 You will see tumumli and the peculiar earthwork called Schutchamer Knob, and the site of a Roman temple at Lowbury Hill a kilometre to the north of the Way. Invisible down below is a stretch of Grim's Ditch. There are various attractive villages to drop down to. 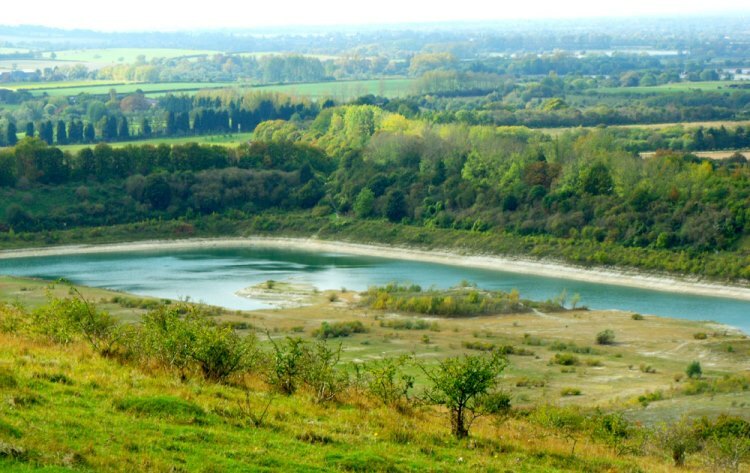 The trail here is generally broad and grassy although, nearing Streatley, this changes; the final few kilometres descend a gradually narrowing path between rising hedgerows, with your first views of the Chilterns across the Thames Valley's narrow Goring Gap. Streatley is a charming old town with plentiful accommodation. The fourth section completes the shift from the open and at times remote feeling landscape of the west. After crossing the Thames into Goring, another old and attractive town, the trail turns north on the Thames Path beside a pretty stretch of that famous river, passing through a couple of nice little villages to the slightly depressed Mongewell Park. Here you can cross back over the Thames to historic Wallingford under its once-important castle built by The Conqueror. The path now turns to the east and, following a hugely atmospheric if a bit tidy stretch of Grims' Ditch for some 5km, you feel immersed in very distant history on what is likely an Iron-age boundary marker. 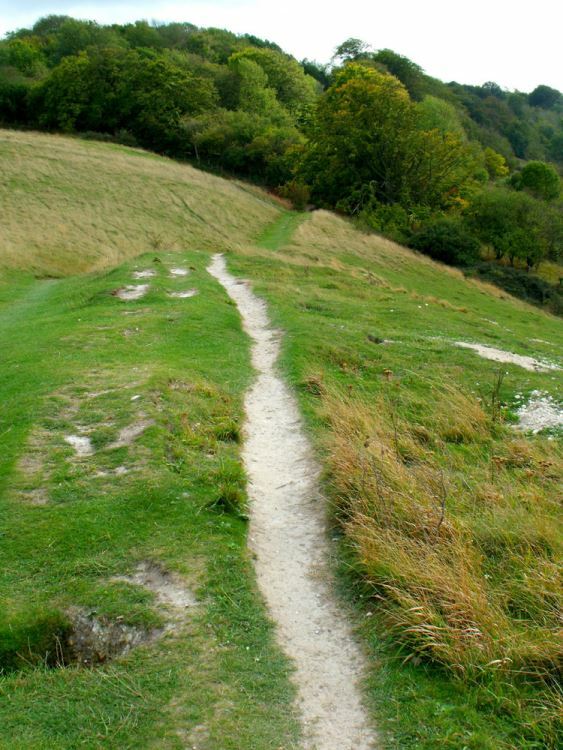 You now start the climb up into the Chilterns, through woods alternating with fields and even nature reserves. For the most part you are in classic domestic English countryside, and views rarely open out. The woodlands are at their best in Spring, when bluebells and wood anemones proliferate on the shady floor; during the very early season, snowdrops and aconites paving the churchyard in the pretty hamlet of Swyncombe are also a special sight. After a while you drop off the escarpment to the east of Watlington, another charming old town (claimed to be England's smallest) and a great overnight stop. Consider climbing the nearly hill for some huge views. The path now turns east into the hills, climbing Lodge Hill for some superb views of the Chilterns at their best before dropping to Princes Risborough and its suburbs: this is definitely a less remote stretch, what with the M40, railway and power lines and some developed towns. It runs in parallel with, and several times crosses, the also-ancient Icknield Way, which carries on towards the sea in Norfolk. From Princes Risborough, it is 10km of hillier escapment-edge, with superb viewpoints at Brush, Whiteleaf and Coombe Hills, on to Wendover, another nice old market town now sadly subsumed into the commuter belt (which has the associated benefit of good hostelries, of course: Walkopedia stayed comfortably in the Red Lion). 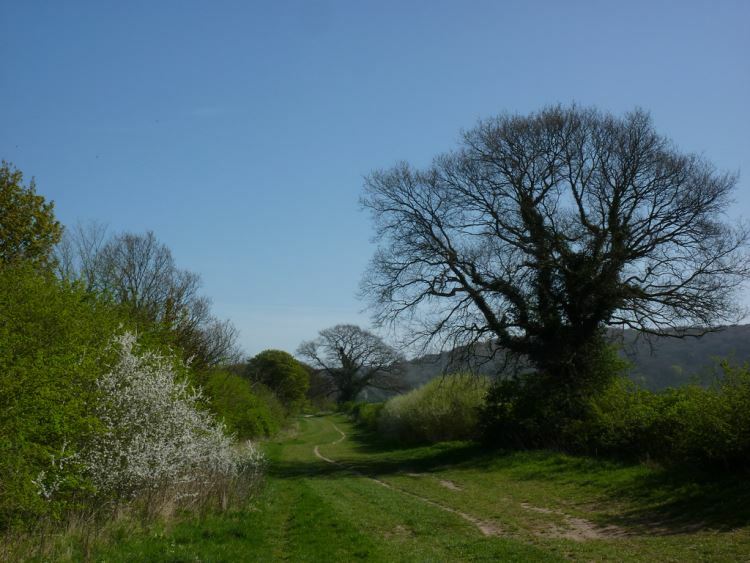 This section is much more inhabited than earlier days, although much is screened by woodland and, when the views do open up, they take in the Vale of Aylesbury's attractive patchwork of enclosures as well as the line of the wooded Chilterns and their woodlands. 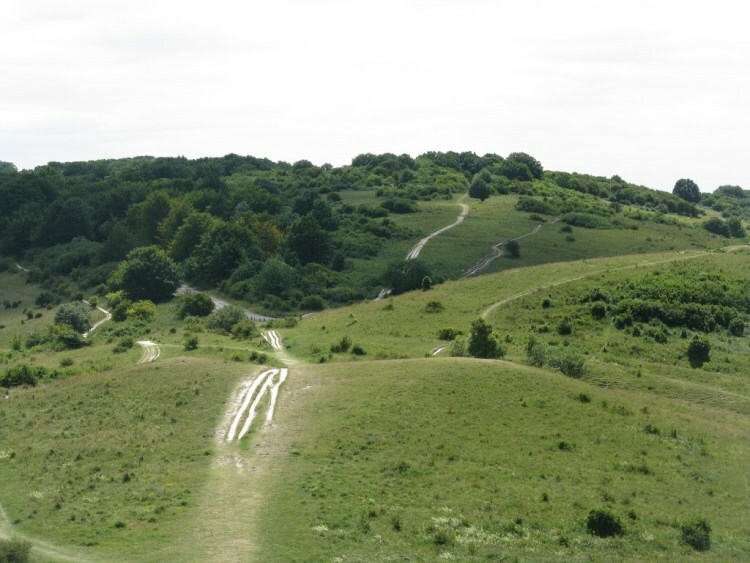 From Wendover you climb a long gentle track up onto the escarpment, then wind through classic Chilterns beech woods, and the old and particularly fine mixed woodlands of Tring Park in particular. 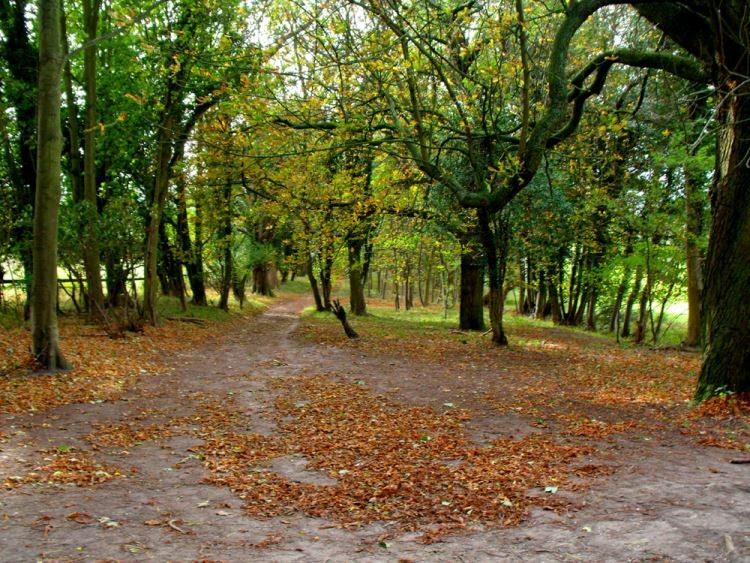 This historic area of park and woodland was beautifully landscaped in the eighteenth century, saved from the ignominy of becoming a golf club in the twentieth (although the Tring Bypass cuts its way through the fields at the escarpment base), and is now publicly owned, and maintained by the Woodland Trust. Just beyond Tring Park, Wigginton and its pub are conveniently placed for lunch, if you havent started too early. The final stretch from Wiggington crosses two unlovely main roads and passes through more beautiful scarp-side woodlands, then emerges onto gorgeous grassy ridgetops, with fine views in all directions. Across a shortish stretch of lower, wildflowery meadow, you climb back to the ridgetop for some more woodland then, a final glorious yomp along the ridgetop to Ivinghoe Beacon, a landmark (and a hill fort, although little now remains of it) with huge views which is a fitting end to the trail, if not of the historic Ridgeway. Ivinghoe village, at the hill's foot, has a large and very fine church. 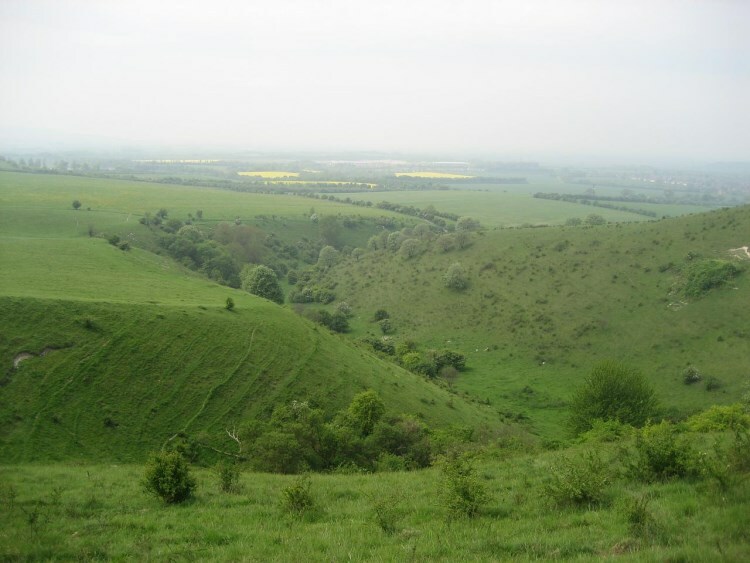 The Ridgeway can be walked in either direction, but finishing at Ivinghoe Beacon may be slightly preferable. 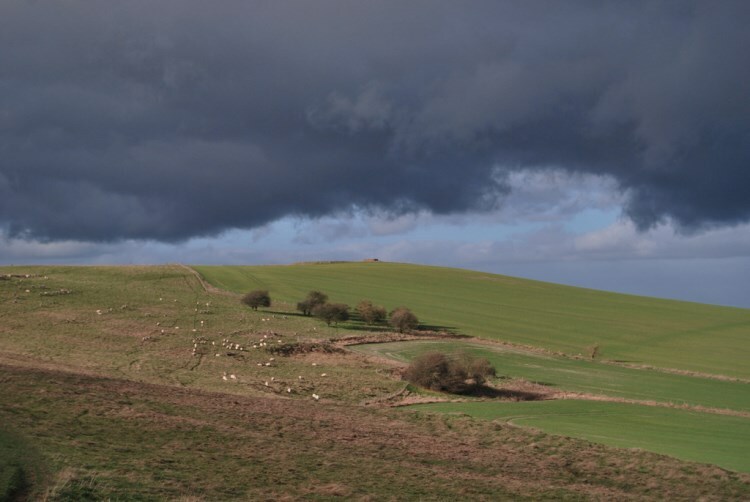 Although the landscape of the Chilterns is tamer than that of the bleaker Wessex downs, completing this wander through prehistoric Britain at the Iron Age fort of Ivinghoe Beacon seems fitting. Further, glorious views across the Vale of Aylesbury from this, one of the highest points in the area, give a suitable sense of occasion, in contrast to the slightly nondescript Overton Hill. Pathfinding is rarely a problem on the Ridgeway. It is an established trail, with clear signage and often a broad bridleway (even byway) to follow. Even so, the logistics can require thought. B&Bs and other accommodation are often on the pricey side, and not always close to the Ridgeway itself. Walking on your own will certainly take careful advance planning, and it may be more cost effective to walk in sections, using your own transport and/or buses to get to and from the path. Western sections can be depressingly rutted as a result of 4 x 4s and bikes, which can make it preferable to walk in the drier seasons. Have a look at TripAdvisor - there are tens of millions of reviews, so you may get good, current views on the walk, accommodation, food and sights along the way. 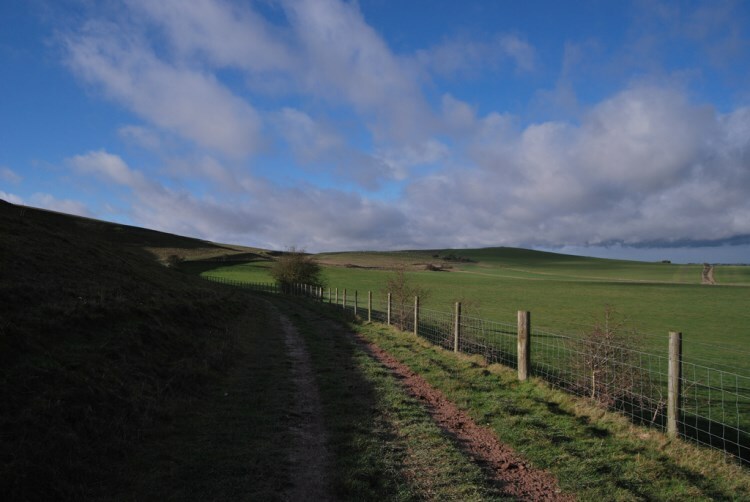 The Ridgeway is a terrific walk. I am not particularly fit and I did between 18 - 22km per day along this very well-marked route.